We frequently visit schools across the UK to ensure our education consultants have a thorough understanding and an up-to-date knowledge of the country’s leading schools. We had the pleasure of visiting The Halcyon International School in central London for pupils aged 11-18. If you would like to know more about this school, or need help finding the best possible senior school for your child, please call one of our education consultants or use our online enquiry form further down this page to discuss your family’s objectives. Established in 2013, The Halcyon is the only not-for-profit, exclusively International Baccalaureate school of its kind in London, and is rapidly growing in popularity. The school originally opened its doors to the middle years aged 11-16, but now teaches students up to the age of 18. The Halcyon takes pride in its multi-culturalism and follows an American style structure for the academic year. Terms are known as ‘semesters’ and although the half term breaks align with British half terms, the pupils of The Halcyon enjoy a longer Summer holiday. Classes at the school never exceed 18 pupils and take place on the school’s campus situated near Marble Arch. The teachers endeavour to take full advantage of the school’s London location by visiting the museums and galleries at their disposal. The Halcyon are prodigious believers in the holistic, mind-broadening benefits of the IB programme and endeavour to encourage a genuine and passionate desire to learn in all of its students. In their own words, and as a not-for-profit, they believe in viewing their children as, “mission not a market”. School director, Barry Mansfield, who was formerly at the International School of Paris, is a firm believer of the school’s mission, and has seen all of his own children successfully pass the IB programmes. The school wholly embraces the present, as well as the past. However, you would be hard pushed to find a more modern learning environment in London. Subjects, such as Maths, are still predominantly taught using the traditional pen and paper but digital learning is incorporated wherever possible. The school’s Digital Learning Leader, Jon Neale, firmly backs the use of technology for learning and believes it the school’s responsibility to show its pupils the many doors and opportunities technology can unlock. Health and the environment also take predominant roles in the lifestyle of the school. The Halcyon stresses the importance of sustainability and only supplies vegetarian meals, all prepared with locally sourced ingredients. This ethos is adopted by all of the pupils, even though many of them do not follow a vegetarian lifestyle at home. The school does not appear to place a great emphasis on sports. Just one hour is dedicated to sports in the school’s sports hall, as well as 2 hours of games at the local Seymour Leisure Centre. However, school clubs are extremely popular with the majority of children attending at least two clubs every week, both before and after the school day, which runs from 9am to 4pm. Yoga and mindfulness classes are offered, as well as football and other more conventional sports. There is no doubt that The Halcyon is a forward-thinking haven for diversity and open-mindedness, and provides a rich and stimulating environment in which children can flourish. For those seeking a modern education for their child, this school will broaden your child’s education and will opens door to possibilities beyond the more confined, traditional pathways of the British school system. To learn more about The Halcyon or to determine whether this school is suited to your child, please call one of our education consultants today. Our education consultants have a thorough knowledge of the leading schools in Britain and can help you find the right school for your family's aspirations and child's personality. To discover more about this award winning service, please visit our Education Consultants page. 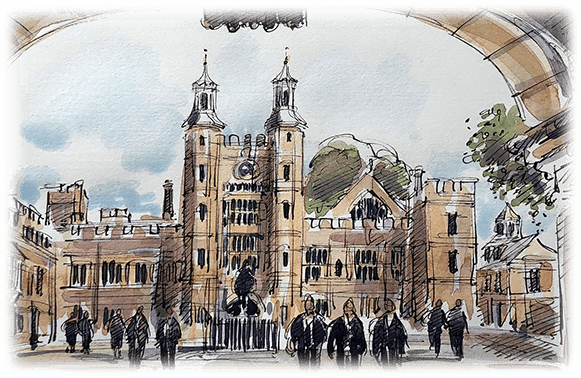 In this article we recount our visit to Queen's Gate Senior School, an independent day school for girls in South Kensington, London.